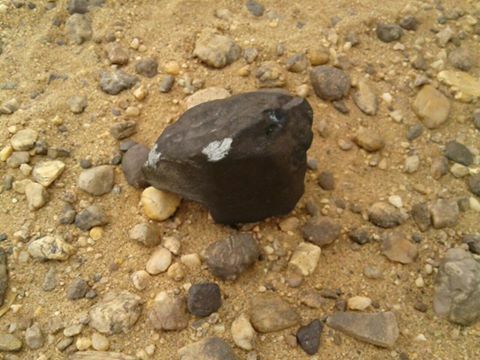 UPDATE- One Moroccan person hunting for the meteorite has died due to heatstroke in 50 degree temps. 14JUL2017 R.I.P. A bolide was seen on 07/12/2017 at approximately 23.30 local time. The fall of a meteorite/s was the Tavn Tavn Tata region in Moroc. Witnesses heard the sound of the body colliding with the ground. At this time a large number of researchers and astronomers, as well as others interested in these stones, are now searching the area of the fall for meteorites. According to our sources is likely to have exceeded the weight of 5000 kg before entering the atmosphere. سقوط نيزك ضخم بنواحي اسافن اقليم طاطا مع سماع دوي اصطدامه بالارض ،ولحد الساعة توجه عدد كبير من الباحثين الفلكيين وكذا المهتمين بهذا النوع من الاحجار إلى مكان سقوطه وحسب مصادرنا يرجح ان يتجاوز وزنه5000كلغ قبل دخوله الغلاف الجوي ،وتعتبر هذه الظاهرة عادية حسب الفلكيين يمكن وقوعها في أي لحظة وكانت اخرها في سنة 2013بروسيا عندما اصطدم نيزك تشيليابنسك والذي تجاوز وزنه 10000طن قبل دخوله الغلاف الجوي للأرض. ... the 17- to 20-meter diameter Chelyabinsk meteor which hit Russia in February 2013, smashing windows and injuring 1,400 people in the process. ... been seen since three-quarters of life on Earth, including the non-avian dinosaurs, were wiped out 66 million years ago by a giant meteor impact. Long fast meteor over North Central Texas this morning! off to the South of Hawley, TX. A METEOR with the explosive power of TEN cruise missiles has struck the Moon – sparking a massive explosion visible with the naked eye. Meteor brighter than moon seen over Devon coast. Six days after a suspected meteor shook Streaky Bay and very briefly lit up parts of South Australia's night sky, the event remains the talk of the town. The bright light in the sky from the meteor is clearly seen in this footage from CCTV at Streaky Bay shot from Mitre 10 and IGA. UA Astronomer Talks Russian Meteor Strike, Asteroid Science and UA's OSIRIS-REx Mission - Duration: 4:24. The University of Arizona 1,023 views. Many remain mysterious while others are explained, like a 10-ton meteor that exploded over Russia and caused panic when it hit Earth in 2013.
with data from the Canadian Meteor Orbit Radar, we reveal that Mars has apex, helion, anti-helion, and toroidal sporadic sources, much as Earth does. Objects larger than 0.6 miles—like the Chelyabinsk meteor, caused by an approximately 22-yard near-Earth asteroid—can have devastating effects. The end of Chilean Meteorites ?? Chile is on the way to limit or forbid meteorite recovery expeditions. The fireball lit up the darkness in Port Lincoln, just before midnight on Friday. New research shows that nearly 90 per cent of frog species alive today owe their existence to the meteor impact that wiped the planet clean of most . ... 1963 treaty about nuclear explosions in space, think of it an a kinetic weapon travelling at 5-10% the speed of light knocking a meteor out of the way. Chile is on the way to limit or forbide meteorite recovery expeditions. As the law is still a proposal, we can contact senator Guido Girardi (ggirardi@senado.cl) to suggest how must be a really good law to protect meteorites and promote a responsible recovery and study of all pieces. Don’t forget this opportunity to help Chile have the best meteoritics law of this planet ! NASA has found 16000 asteroids near Earth. Don't panic. June 30 is International Asteroid Day. Have you ever wondered how asteroids are discovered? Here's the story. Did you see a bright, fast-moving light over Adelaide last night? What people saw was a very bright fireball, that was tracked by the Desert ... Desert Fireball Network observatory at Mt Ives, south of Lake Gairdner. ... captured on a security camera at Port Lincoln. Experts are not sure if it's a meteor or a piece of space junk. Nor are they sure where, or if, it landed. The Southern Delta Aquarid meteor shower promises to add some glitter to the night sky in July, with as many as 25 meteors per hour during its peak. Among most recent NEOs entering the Earth's atmosphere, a large fireball disintegrated in the skies over Chelyabinsk on 15 February 2013.